But first, breakfast at the local cafe. It’s comped by our hotel so we figured why not. It was chocolate croissants, cafe lattes and an interesting fruit juice that tasted like apple but had hints of other fruits too. It was delicious. We decided we’d walk to the Colosseum from the hotel, starting by the Basilica of Santa Maria Maggiore. We had a general sense of where we were going, meandering down side streets and Vespa-lined sidewalks. It was the oddest feeling of deja vu– we’re in Rome, but this doesn’t feel any different than walking around the Bronx. There are a lot of Italians. They all speak English. There is a lot of graffiti. Cars are double-parked on streets barely wide enough to drive through and there are a lot of random shrines. The architecture is also similar. It’s still really hot today but not as bad as yesterday. There is definitely less humidity. Before long the density of tourists became much thicker and we stopped relying on our instincts and started relying on herd mentality. Turning down a side street, the Colosseum first came into view. It’s funny. We’re staring at the Colosseum– that half-crumbled round thing built a million years ago that I first learned about watching re-runs of Where in the World is Carmen Sandiego? All the images and diagrams we ever see of it make it seem like it’s in the middle of an empty field or something. Hardly the case. It’s right in the middle of an urban landscape. I was feeling lazy today and didn’t feel like dragging around a bunch of camera gear, so I limited myself to a single body with a 50mm. It was very limiting indeed, given how massive the Colosseum is when you’re standing at its base. I’m normally all about creative constraint but I was having a really hard time capturing the grandness of this ancient venue. It doesn’t even feel real until you get up close and personal with the thing. Once you can see the cracks, the pores, the weathering of the stone, you begin to realize that this Colosseum you’ve only ever read about in history books is very, very real. Then you go inside the foyer, where the scale of the Colosseum becomes even more impressive. High archways support millions of pounds of rock above your head, which would in turn support the weight of thousands of spectators. We purchased tickets in advance but according to the voucher, they could not be redeemed until 10:30 so we left again and wandered outside, marveling at the ruins around us. The grounds where you find the Colosseum are also home to one end of the Via Sacra (the Sacred Road), a path that takes you past many, many famous ancient Roman ruins as well as the Arch of Constantine. 10:30 finally came around so we punched our tickets and entered. The view from inside was just as spectacular as from out. One thing that was new to me was that at the center of the Colosseum (where you’d expect there to be solid floor) there appears to be an entire underground city. It is in fact an underground city of sorts– the passages where gladiators and animals would be staged for combat before emerging via trap doors. There used to be a floor that covered the bottom of the arena and obscured these areas from view, but it has long since collapsed. I’m speculating but I’m guessing there were at least 2-3 floors in and of themselves under the ground of the arena. That’s a really deep pit. 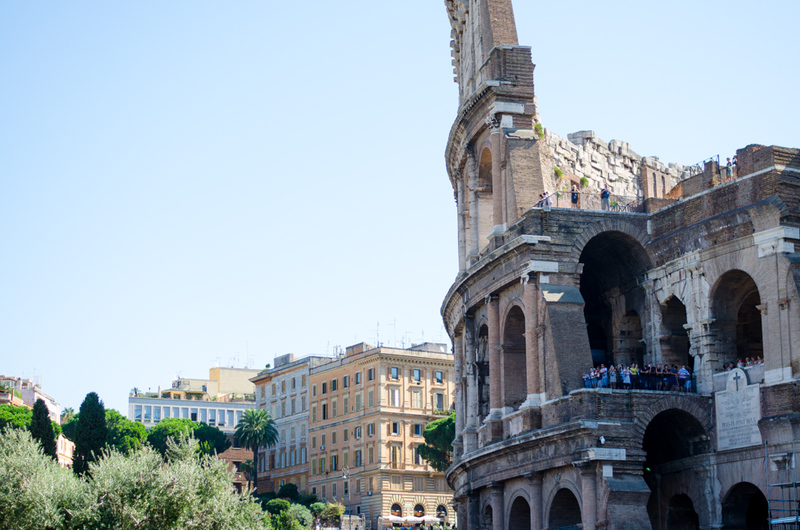 Rome recently instituted some new tax on hotel owners, whereby guests must pay an additional 1-3 Euros per night. The city claims tourists don’t pay their share, which makes no goddamn sense. Nothing in Rome is free. Hotels are expensive. Food is expensive. Transportation is expensive. All of which are taxed. The final justification for the tax is to go towards continued maintenance of the ancient monuments. That much makes a little sense, at least. Afterwards we stopped by the cafe at the subway station for lunch since it was convenient. Subway food never led us wrong in Japan so we assumed the same here, ordering a prosciutto and cheese panini and a plate of spaghetti. I liked the panini but her spaghetti was just noodles soaked in olive oil and egg. Carbonara means something completely different here, it seems. Pretty weird. We both got some gelato from the subway. She ordered strawberry (fragola) which was delicious and tasted like actual strawberry. I ordered what looked like vanilla chocolate chip but tasted like heaven. It wasn’t vanilla. It was straciatella. Thankfully I’m not the only one who feels this way. So, the Colosseum. It’s every bit as impressive in person as we thought it would be.